The Athabasca River is a Canadian Heritage River, originating 100 km south of Jasper from the glaciers of the Columbia Icefield - the largest icefield in North America. You'll meet in the town of Jasper in the RV Parking lot adjacent to the Jasper Home Building Centre. Please arrive 15 minutes prior to departure to allow for last minute registration. You'll then travel 8 km south of town to the put in point. Your guides will provide you with a wetsuit, booties, paddle jacket, life jacket as well as fleece tops and neoprene gloves for those really chilly days. A towel, dry set of clothes, a snack and water may be left in the bus for after your trip. Wear your shorts or a bathing suit under your wetsuit. It's not recommended you bring valuables along on the bus. You can leave your camera as well. Your driver will be taking photos at several locations along the river so there’s no need for your camera or phone on the river. Pictures will be ready for purchase on a memory stick at the end of your adventure. After suiting up in clean dry wetsuits and a safety talk, head down the river. The section begins with a 10-minute float. This allows the paddler time to feel comfortable in the raft, experience the river environment and take in the 360-degree Mountain View. After this short float, the grade 2 rapids begin. Grade 2 is big enough to get everyone who wants to get wet, wet but it is unlikely anyone will go for an unexpected swim. If you are brave enough, there are places where you can go for a swim in the glacial water. 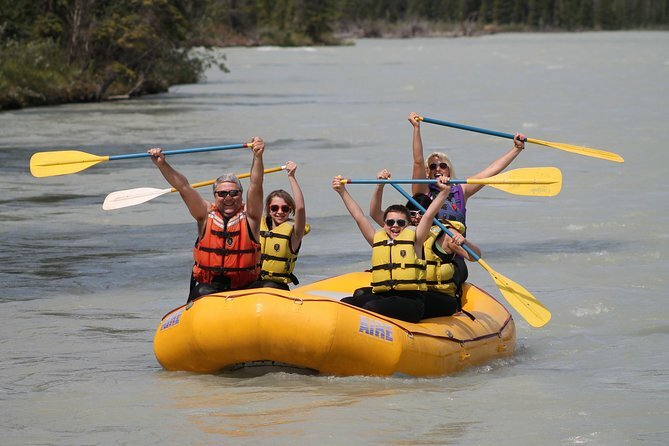 After four or five sections of rapids, the Miette River joins the Athabasca, highlighting the colour difference between a rain and snow fed river and a glacier fed river. The trip ends just around the corner at Old Fort Point. After getting out of your wet gear, it is a 3 km drive back to town. All trips are in 8 person-guided rafts. All necessary equipment is provided. Rain or shine, this trip is great for ages 5 to 95.